Address: 2 the 5th Building, 30 Decaili, Zhuyeshan Block, Jiangan District, Wuhan Ups and downs for decades, all over the body wrapped around my illness. Pulled a long face all day, with my poor sagging spirit. Cervical hyperplasia and low back pain, coronary heart disease and hypertension. Sciatic nerve pain with the right leg sore, feet swollen and left foot anesthesia. Sick but dare not to go to hospital, in case that I can not afford the expenditure. 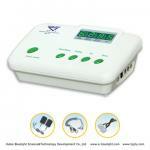 Heard of the Eight-diagram Apparatus, which is capable of curing and keeping fit. Since the Bluelight was invited into my home, I stood far away from the hospital gate. Treating with it every day for several years, I harvested great curative effect. All the symptoms above were improved, with decreasing and reduction. No stiff neck anymore or fainted head, neither lumbar pain anymore nor tinnitus. The stable blood pressure calls an end to medicine, and swollen feet are in elimination. Sciatic nerve is in turning for the better, left numb foot is relieved greatly. Having not caught a cold for years, my immune function was enhanced. The diseases are relieving and reducing, and my mood and spirit are upgrading. Asking why getting big curative effect, I should first of all thank Director Zhou. He talks every day and I listen, to understand the use with correct methods. Secondly we must persist in treating ourselves, keep our unwavering confidence. Thirdly we must trust the Eight-diagram Apparatus, that only by upholding for victory. Treating twice a day uninterruptedly, it requires patience and determination. Bluelight Eight-Diagram is really magical, without taking medicine or injection. It cures the diseases if we have any, and it keeps our physical fitness if we have not. Since the bluelight came into the door, like a good doctor was invited in my home. We can cure our own diseases with it, without spending money or going out. 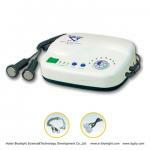 A good instrument the Bluelight really is, and my wife and me were both benefited. Despite a 70-year-body we are still working physically, no worse than a young boy. All words in one sentence, I am grateful to the Bluelight High Technology Company.